The thing that amazes me about the Open Stub J-Pole is it’s simple design that performs well. I am not saying it will out-perform commercially built high-gain antennas but that it performs well using a few parts. I think it’s even easier than building a copper J-pole and even ground plane antennas (maybe just a step up). One of the big complaints that I’ve been reading about the Open Stub J-Pole is that it’s difficult to tune. The only way to tune the antenna is to actually cut the stubs a little bit at a time. If you cut too much the stub is now worth it’s weight in scrap. Now that I am the owner of a GMRS radio, I wanted to build a OSJ-Pole that you can adjust with ease. I found plans on the internet for a Copper Cactus J-Pole that used a brass screw threaded into the “Tuning element”, or the Short stub (By Glynn Rogers, K4ABT). I am using that idea on the OSJ-Pole. What I ended up doing is cutting about 3/8″ off the top of the short stub, drilling a hole down the center of the rod, tapped it with a 10-32 thread and inserting a screw with a jam nut. Now I can move the screw in and out to obtain the best SWR and then tightening the jam nut to secure the screw. I tried to make a custom angle bracket with what I thought was the correct spacing but the SWR was horrible So I used a extra bracket from one of the many Dual Band OSJ-Poles I’ve built. It worked out pretty well. Here is a close up of the tuning screw. 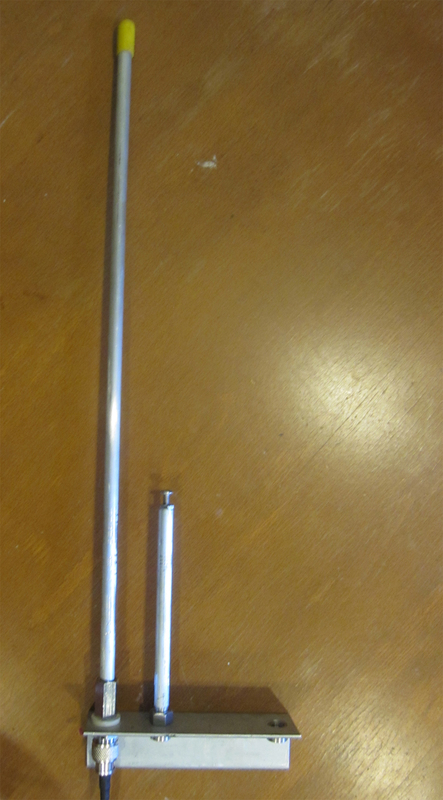 I ended up using a lathe and a drill bit (.159) to put a 2″ hole at the end of the 3/8″ round short element. I then used a bottoming tap to make the 10-32 threads as far as I can go. I then used a 1-1/2″ Screw and a 10-32 Jam nut to lock the screw in place. I am sure this can be applied to any of the Open Stub J-poles that are out there. Just make sure to cut some material off the elements so you have room to adjust above and below the calculated line. For the dual band you’ll have two adjusters. Since most people don’t have lathe access to make the hole in the center of the 3/8″ rod. A vice, center punch (automatic or not) and a steady hand with a drill will do. I would make a pilot hole with the smallest drill bit in your stock (under #21 or .159″). I was able to tune the AOSJ-Pole from a 1.5 to a 1.0. Since I am building more and more antennas, I saving my pennies to buy a antenna analyzer so I can give better reports with more information than what I am getting on my SWR meter. Next project will be a GMRS 4 Element Yagi. 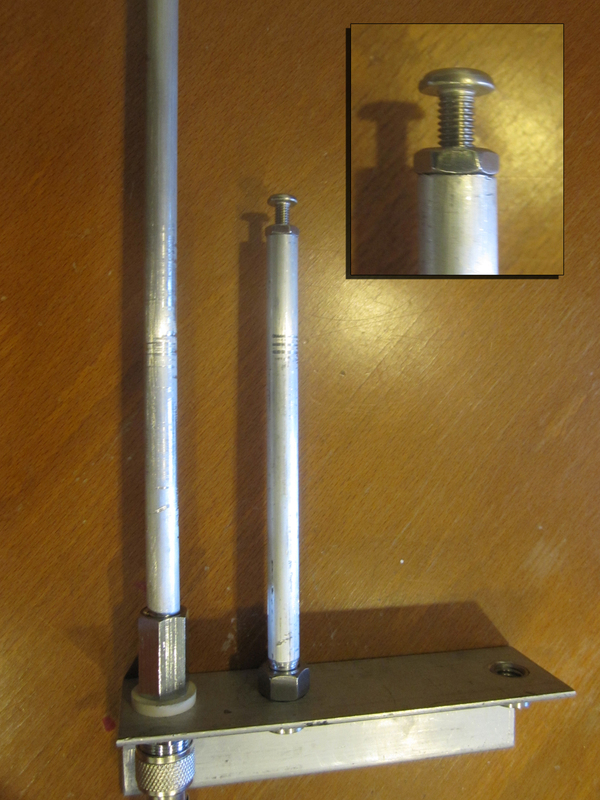 For the Dual Band version of this antenna, would the adjustment feature be possible with a screw in the shortest element, or would if be preferable to tune both stubs? Must the aluminum mount be grounded or is it acceptable to simply mount it to a wooden structure such as peak of the roof? Yes, the same can be applied to the dual band version to adjust the SWR for both 2M and 440Mhz. Therefore an adjustment feature for each of the two stubs will be effective? I would assume yes. I never tried it but it makes sense. If I ever make another one, I will post information about it. From what I’ve read and done, the J-Pole does not need ground/grounding and it doesn’t require it to insulated when mounting. Thank you. I am keen to build this. If you might clarify something… it seems the driven element (where the coax terminates) is quite naturally not connected to the aluminum base (well, the “ground” or shield of the coax is). But what of the stubs? These appear to be simply screwed into the aluminum base. If so, then does not the size, angle, and mounting of this base have some bearing upon the perhaps rather complex relationship between the driven element and the stubs? Trying to source the aluminum angle I have decided to resort to some scrap which does allow for the exact relationships between the vertical elements but does not come close to matching the overall size of the design. So wondering if this will prove problematic. The DE is insulated from the rest of the stubs. The bracket/base and the stubs are “Connected” to the angle when they are threaded through and tightened with the jam nuts as shown on my blue prints as well as the source of where I got the dimensions from. I would also assume the spacing of the holes and size and area of the base/bracket apply to the resonate frequency of both 2M and 440Mhz and it’s SWR. I am not an EE and I am not the designer of this antenna so I can not give you definite answers. Sorry if I am coming off as rather rude but you are over complicating a $15 antenna. I understand you want to get the best “Bang for your buck” and I understand you want to have your “ducks in a row” but this antenna is by no means comparable to Yagi or even a Loop when it comes to gain and performance. I tried modeling this antenna but had a difficult time in 4NEC2. This person modeled it and hopefully it will provide you a little more information. Just like with other amateurs before me, I tinkered with this antenna. When I saw the Adjustable J-Pole antenna on the Buxcomm page, I thought I could apply it to the OSJ-Pole as an alternative to cutting/grinding the elements and the adjusting seem to work as it show a difference on my SWR bridge. I wish I had the knowledge and equipment to give a in-depth review of the antenna and my modifications. I thought the least I can do is to make an actual blue print (or something close to it) that gave a better visual idea how to make the antenna than what I had to go by. Your starting to dive into an area where I wish I can provide you the facts with the information to back it up. I guess when it comes down to it, you’ll have to build the antenna and see for yourself. Worst thing that might happen is that you’ll be out $15-25. Even though it’s not my design (I want to make that clear), I’ve had many people come back with positive results. However I no one has came back about the adjustable version. Sorry if I came across as one who demands perfection 🙂 Indeed it is kind of you to share this project with everyone, and I am grateful. And thanks for clarifying that which escaped me. I will give this a try and post back here as to the results. If there was no demand for perfection then we wouldn’t have a lot of the amazing technology that we’re dependent on today. I also want to know that my money is well spent. I would rather apply it to something that will work instead of taking a “Shot in the dark” on something that might work. However if you don’t take risk then you never know. I wish I can answer your questions when it comes to the electrical/RF properties of the antenna. At this point in my life I do not have the equipment or even the proper knowledge to provide answers. I’m hoping that at some point I will but it seems to be far away. If you do some research of this particular antenna, you will find the write-ups and controversies from people who know a lot more about antennas. From a mechanical standpoint, It’s a decent antenna for the price. Weakest point is being the SO-239 connector/adapter and it’s plastic insulators which is not really an issue. Even with that I’ve had this antenna outdoors for over 10 years w/o issue and worked fine. It’s no Yagi or commercially made antenna with gain but it’s better than a ground plane, dipole and other antennas of the sorts. I am looking forward to your results. Good idea! But as for adjusting wouldn’t be easier if you could make the bottom thread longer and use it for lifting/lowering the stick? For those who want to build this antenna, forget Home Dep. got to your local “Metal Supply” store. Went to my local Metal supply company and picked up a 12 foot rod of 3/8 aluminum for about $9.00. With this mod I got it tuned down to a good 1:1 match. This is my new Base antenna. I’ve considered making an adjustable Open Stub J-Pole by making the elements 1″ longer and extending the threaded section on each by 1″, giving +/- 1/2″ of adjustment. That would let me alter the height above the mounting bracket by simply adjusting where the upper nut is on the element. Would the portion that would extend below the bracket have any significant effect on the antenna’s performance? I would think that it would not given that the mounting hardware and pole is also down there. I have to admit that I’m a neophyte when it comes to antenna design, so forgive my idea belies my lack of experience. P.S. As a boater, I’m paranoid about mixing metals because of galvanic corrosion. That could lead a loss of electrical contact between them. You might consider replacing your tuning screw with an aluminum one, adding dielectric grease on the threads to keep out moisture. Since the design also uses stainless steel nuts, and stainless steel is much higher on the pecking order than aluminum, I’d also planned to thoroughly seal the nuts on mine with paint and/or caulk. can i use a hollow 1/2″ aluminum rod as replacement for the solid one? can i attach the rods directly to the bracket except for the driven element which is insulated and no continuity with the bracket? I am wondering if this J-pole design can accommodate 2m, 70cm, and also MURS, GMRS in 1 antenna or what would the space requirement be for building 1 for GMRS,MURS also and mounting them together on the same pole. I can buy a duplexer if needed. I am using a Leixen VV-898e for my base.